For two years, the Wilson Center and Circle of Blue have explored the contest for food, water, and energy in India and the troubling ways it plays out across the country. In part one of this series outlining our findings, we explained the basics of India’s natural resource management choke point. 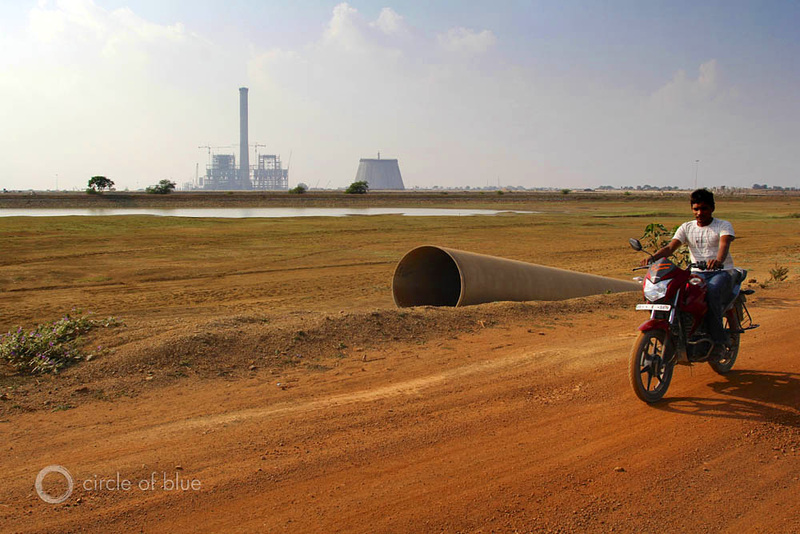 A coal-fired power plant under construction near the Mahanadi River in Chhattisgarh. Already, 73 percent of the state’s electrical production relies on the Mahanadi and 58,000 megawatts of new generating capacity is planned. Click image to enlarge. The good news is that India’s government has started to shift its priorities in terms of how it manages the country’s economy and natural resources. Some changes are visible on the ground: Renewable energy is gaining traction and ambitious solar and wind targets have been set. Sugar-bean, a less water-intensive crop, is being discussed in favor of sugarcane. Less water-intensive rice cultivation is also a priority in certain regions. Additionally, important transitions are occurring in government. Among new Prime Minister Narendra Modi’s first national initiatives was changing the name of the Ministry of Environment and Forests to the Ministry of Environment, Forests, and Climate Change. This sends a strong signal that the government is serious in addressing climate change. Meanwhile, his Swachh Bharat Abhiyan, or “Clean India,” campaign to scrub India’s streets and countryside has the potential to evolve into a national air and water cleanup program. Last May, Modi promised to clean up the Ganga, one of the world’s most polluted rivers. Four months later, his government committed 510 billion rupees ($8.1 billion) over the next five years to stop discharges of untreated sewage and wastewater from 118 of the 222 towns and cities along the river. In support of the prime minister’s initiative, the Indian Supreme Court in October assigned the National Green Tribunal to enforce water quality statutes on industries along the 1,600-mile-long river and its tributaries. Cautious optimism may be the order of the day. Previous governments have poured money into cleaning up the Ganga with little success. Additionally, while Modi’s government is the first to explicitly name Ganga rejuvenation as a chief priority of the Ministry of Water Resources, the jury is still out on how and if it will deliver on the plan to clean the river by 2018. In early December, the Modi government indicated it was prepared to make permanent an indefinite halt in hydropower construction in Uttarakhand, a small mountainous state. This decision would safeguard water quality and water supply in the three fast-flowing Himalayan rivers that merge to form the Ganga. This government decision comes 19 months after the vicious floods along those same rivers in Uttarakhand killed an estimated 30,000 people and decimated the state’s hydropower industry. In April 2014, a special study commission, ordered by the Supreme Court, issued a report on the causes of the flood. The report recommended shutting down 23 proposed hydropower projects and curtailing construction of others. Massive flooding in June 2013 killed thousands in the Himalayan state of Uttarakhand and damaged dams. In the wake of the disaster, a special commission recommended shutting down 23 proposed hydropower projections and delaying others. Click image to enlarge. In an affidavit filed with the Supreme Court, B. B. Barman, the director of the Ministry of Environment, Forests, and Climate Change, said his agency would abide by the recommendations. The promising shift in resource management comes amid an assessment by the Modi government of the administration of environmental laws in India’s economic development. That assessment, by a high level commission, was completed in November and is under review by the Ministry of Environment, Forests, and Climate Change. The report could lead to new permitting agencies and a restructuring of regulatory authority. The commission’s report proposes to fix India’s broken environmental management program by making a fundamental trade in regulatory principles. In exchange for hastening government review of big resource-threatening projects – mines, power plants, transmission lines, highways, big industrial plants – the commission calls for India to establish a credible regulatory regime that enforces environmental law and actively investigates and penalizes violations. The active steps proposed by the commission are two-fold. Rather controversially, the first is to exempt some big project proposals from the citizen involvement and public hearing process required by India’s environmental impact assessment rules. The second is to replace the politically appointed and frequently corrupt national and state pollution control boards, which review and issue permits, with professionally staffed national and state environmental management agencies. The new agencies would be politically independent, review permit applications with contemporary scientific standards, and issue decisions. These are major steps, but experts with whom we spoke also offered other recommendations for improving India’s natural resource governance. Given the existence of the Bureau of Energy Efficiency, a public entity formed in 2002 and charged with developing policies and strategies that reduce energy intensity levels, the government could establish a complementary Bureau of Water Efficiency. India’s National Action Plan on Climate Change calls for water inefficiencies to be reduced by 20 percent. While there has reportedly been ministerial-level talk of setting up a water efficiency body, nothing concrete has materialized. India’s government should also establish clear and separate natural resource policy responsibilities for central and local governments. “We don’t need central government policy, we need central government guidance and broad legislation,” argues Chandra Bhushan of the Center for Science and Environment. Implementation and execution, he says, should be handled at the city and village level. Water policy, however, is controversial in this regard. Generally, water matters come under the purview of India’s state governments. However, as a vital resource, some voices in India believe the national government should have a more hands-on role in all aspects of water policy. Either way, the tension between state and central decision making will need to be accounted for if a meaningful solution is to be reached on this most politically charged matter. Finally, despite the political risks, experts with whom we spoke supported the idea of water being priced volumetrically. Water metering, they explain, will make water use more efficient, reveal physical and administrative leakages in the system, and – in the spirit of fairness – enable consumers to be charged for consuming more. The alternative – the status quo, in which authorities simply duck the water pricing issue – is untenable, says Joydeep Gupta of The Third Pole Project. Because high transmission losses make the public utility unreliable and chronically low in supply, the poor are currently forced to pay high costs from private sources. Public-private collaborations should be scaled up where appropriate, and with clear insights drawn from past experiences of how best to deploy private sector goals, expertise, and capital in the delivery of public goods and services. Although its profit motive is sometimes perceived to be at odds with matters of equitable natural resource distribution, the business community has indicated a strong interest in collaborating with Indian government officials to facilitate access to water and energy. There is tremendous scope for the private sector to help manage water supply, wastewater, and sewage disposal – thanks in great part to its reputation for efficiency. Already, there has been considerable corporate involvement in Indian water treatment plants. In the chronically water-poor state of Maharashtra, the French company Veolia is managing water treatment plants for the entire city of Nagpur. The distribution of water, however, is still looked after by municipal officials. 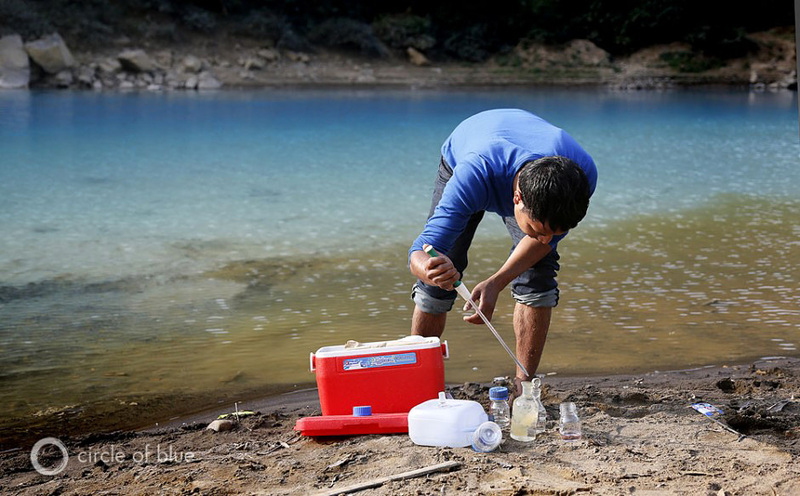 A zoologist with the Meghalaya Pollution Control Board tests the acidity of the Lukha River. The otherwordly blue waters had a pH of 4.5, sufficient acidity to kill fish. Click image to enlarge. Another opportunity for private sector engagement lies in renewables, particularly in terms of providing research and development inputs. Ghosh calls renewables a high-potential sector that can potentially “fill the gap” in energy supply and demand. There are positive experiences on which to build. The Bureau of Energy Efficiency is often held up as a major policy achievement. One of its initiatives, currently in a three-year pilot stage and designed similar to cap-and-trade schemes, encourages large energy-intensive industries to be judicious in their energy use by setting consumption targets. Companies are then provided with energy savings certificates that can be sold to other companies that exceed their consumption targets. The caveat here is that while these industry-focused initiatives are laudable, it is the agricultural sector that is most energy inefficient and is estimated to have the greatest potential for energy savings. While it’s fair to say India does not need more bureaucracy, another bureau of energy efficiency focused exclusively on agriculture may prove a worthwhile addition. Experts also point to a series of state-level success stories. In Gujarat, local authorities have introduced reforms that limit the amount of power supplied to agricultural households, obliging farmers to be more careful in their use of electric wells. Officials in Tamil Nadu, who preside over an 11 percent water deficit in their state, have imposed stringent water conservation guidelines in both rural and urban areas. And in Punjab – where water has been used wastefully for decades – state leaders have begun to implement more water-efficient agricultural policies. Doing a better job of sharing successful practices, especially where clear economic gains are apparent, will also be critical in driving local support that can bring about national change. In May 2014, Prime Minister Modi took office after winning India’s national elections by a huge margin. In his previous position as chief minister of Gujarat, he pursued numerous renewable energy projects, including the construction of one of the largest solar energy parks in Asia. Modi seems to understand the imperative of pursuing efficient and sustainable natural resource policies, with major boosts given to solar and wind initiatives in recent months. He also enjoys a sufficiently large mandate (and presumably the ability to muster sufficient political will) to push through difficult but necessary reforms. To be sure, as “Choke Point: India” has consistently made clear, the challenges remain immense. Fixing India will take at least a generation, and likely much more. While there has been a process of intellectual “thinking through” about corrective policy options, actual implementation has been “much slower,” says Varad Pande of Dalberg Global Development Advisors and New York University. Still, considerable progress has been made, and more is likely. Modi’s leadership offers some reason for hope. After decades of food, water, and energy mismanagement, India seems prepared to pursue a fresh path to recovery. Photo and Image Credit: Used with permission courtesy of Aubrey Ann Parker and Erin Aigner/Circle of Blue, and Dhruv Malhota/Contact Press Images for Circle of Blue. Interns and Externs and eBooks, Oh My!